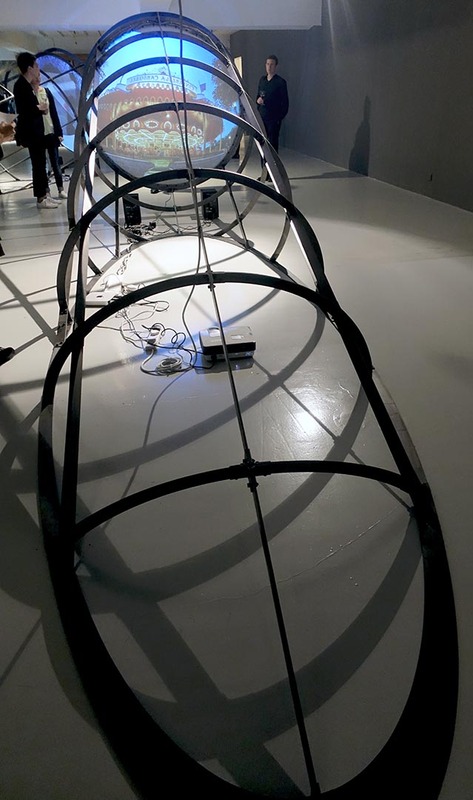 HONG KONG — Maurice Benayoun’s new show at the Osage Gallery in Hong Kong, Just Dig It, consists of five latticed, skeletal metal sculptures capped by circular projector screens showing various 2D projections. Some of the sculptures also have motion-sensing cameras to encourage audience interaction. The show spans some of Benayoun’s works from 1995 to the present, beginning when the World Wide Web was just emerging, to more current concerns of shifting borders and physical and digital geographies. When the “Tunnel Under the Atlantic” first went on view in 1995, split between the Museum of Contemporary Art of Montreal and Centre Georges Pompidou in Paris, it consisted of a lot of firsts, including the first VR installation to cross continents and real-time video used in a virtual reality environment. The exhibition also required visitors to participate by standing in front of the virtual tunnels in order for them to function. It was a novel concept at the time, and one that Benayoun was prescient in using. The images included in “Tunnel Under the Atlantic” resemble early 3D game engines, with their uncanny sense of entering a vortex or tunnel. Benayoun’s works were ahead of their time, as they leapt into the future of high-speed bandwidth and endless information conduits years before these type of experiences became a fixed reality in everyday life. In 1995, when the first installation was made, hypertext had only been around for two years. It’s hard to believe that it was only in 1992 that the US Congress allowed the opening of the internet for non-research and educational purposes, 1994 when the Netscape browser showed up, and 1995 when high-speed internet backbones were first implemented. Benayoun’s second piece in the show, “Inside the Paris-New Delhi Tunnel” (1997), connects those two cities by using the same mechanisms as “Tunnel Under the Atlantic.” The third piece is the newer “Colors Tunnel and Borders Tunnel” (2016), which looks at the subtle use of color in internet images — from the prevalence of black and white in images of Saudi Arabia to the abundance of pink in clothing and architecture in India — and how it frames how we understand culture and geographic shifts. The newer pieces also have motion detection sensors that respond to the viewer’s body language, enticing visitors to virtually travel to meet others inside the gallery. When viewing the five structures together, the concept of virtuality is subsumed by the raw physicality of the metal, skeletal frames. Overhead light splays dramatic shadows across the gallery floor producing ghostly doubles. Some of the sculptures project live images of what’s occurring on the other side of the gallery on their circular projector screens. The specter of those hulking, silent frames looming across the gallery like modern-day dinosaurs serve as delicate containers housing the ephemeral. Their permanent physicality was more powerful than the fleeting digital images contained within them. While the works dig physical and virtual tunnels to break through physical, communicative, and cultural obstacles and create new dialogues, it was those metal exoskeletons that continued to haunt me after I left the gallery. The sculptures’ fleeting digital moments from when those cities first connected, once fresh and vital, are now inevitably relegated to history. Benayoun’s works broke a lot of virtual firsts that now seem commonplace, and have inevitably been taken for granted by a media-saturated world. This show serves as their resurrection. Maurice Benayoun: JUST DIG/IT! continues at Osage Gallery (4/F, 20 Hing Yip Street, Kwun Tong, Kowloon, Hong Kong) through May 25.